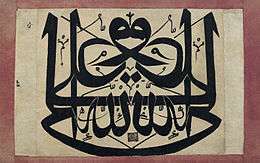 Hurufism (Arabic: حروفية‎‎ hurufiyya, adjective form hurufi literal meaning "letters" [of the alphabet]) was a  Sufi doctrine, which was born in Azerbaijan and spread in areas of western Persia and Anatolia in later 14th – early 15th century. The founder and spiritual head of the Hurufi movement was Azerbaijanian Fażlu l-Lāh Astar-Ābādī, also called Nāimī (1340–94). Born in Astrabad, Iran, he was strongly drawn to Sufism and the teachings of Mansur Al-Hallaj and Rumi at an early age. In the mid-1370s Nāimī started to propagate his teachings all over Persia and Azerbaijan. While living in Tabriz, Fazlallah gained an elite following in the Jalayirid court, where the writing of his main work, Jawidan-Al-Kabir, allegedly took place. At that time he was still in the mainstream of Sufi tradition. Later, he did move towards more esoteric spirituality, and, failing to convert Timur, was executed in 1394 near Alinja castle in Nakhchivan by the ruler's son Miran Shah. The uprising of Hurufis, who had gathered a large following, was crushed in Azerbaijan, but the popular movement survived for another decade or so in different guises. According to Fazlallah, the key to open seventh sealed book, the Qur'an, is a kabbalistic system of letters that is expounded by later Hurufis in the Hidayat-nama, Jawidan and in the Mahram-Nama. The Universe is eternal and moves by rotation. God's visage is imperishable and is manifest in Man, the best of forms — zuhur kibriya. God is incarnated in every atom. Hurufis considered Fażlu l-Lāh, a manifestation of God's force after Adam, Moses and Muhammad. God is also embodied in words and the 28 letters of the Arabic alphabet and the 32 letters of Persian one are the basis for love and beauty in the world. Seven is a key number corresponding to noble parts of the face, the verses of Al-Fatiha and verbal confession of faith. Man is a supreme copy of the divine and the key to haqiqa. According to R. N. Frye's Cambridge History of Iran, Hurufism was an expression of Ismailism in its mystical identification of human figure, but differed in its recognition of haqiqa in the substance of letters rather than in the person of the Imam. After his death Nāimī's ideas were developed and propagated by ‘Alī ‘Imādu d-Dīn Nasīmī and Ali-ul A'la in Azerbaijan and Seyid Ishag in Turkey. Poet Nasīmī (?–1417) and other Hurufis make kabbalistic tendencies subordinate to mystic concepts of Sufism, and specifically those of Mansur Al-Hallaj, who was another great influence on Nasīmī. 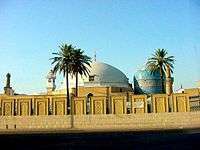 Through Nasīmī's poetry Hurufi ideas influenced, in different degrees, people like Niyaz-i Misri, Fuzuli, Habibi, Khatai (Ismail I), and Rushani. The Bektashi Sufi order that was once widespread in Anatolia and the Balkans was a repository for the Hurufi teachings and writings. In fact, many of Hurufi manuscripts that are existent today were safeguarded in the libraries of Bektashi lodges. Hurufi terms and concepts permeate Bektashi poetry. Gül Baba provided an extensive compendium of Hurufi ideas in The Key to the Unseen. The Shattari tariqah is a contemporary repository of Hurf-e-Muqattiyat (secrets of the alphabets). The scenes of Fadlullah's execution and of Nasimi's brutal flailing in Aleppo appear in the Azeri language movie "Nasimi" (1973). Hurufism plays a role in Turkish author Orhan Pamuk's novel The Black Book. Hurufism also plays a role in Ian McDonald's futuristic novel, "The Dervish House". ↑ Algar, Hamid. "HORUFISM". Encyclopædia Iranica. Retrieved 26 April 2016. ↑ Bolle, Kees W. (1987). Secrecy in Religions. Brill Archive. p. 89. ISBN 90-04-08342-1. ↑ Frye, Richard; Fisher, William Bayne (1968). The Cambridge History of Iran. Cambridge University Press. p. 624. ISBN 0-521-20094-6. ↑ Shattari Archived April 20, 2008, at the Wayback Machine. Encyclopedia Iranica, ASTARĀBĀDĪ, FAŻLALLĀH (d. 796/1394), founder of the Ḥorūfī sect. Encyclopedia Iranica, ʿALĪ AL-AʿLĀ (d. 822/1419), also known as Amīr Sayyed ʿAlī, principal successor of Fażlallāh Astarābādī. Abdülbâki Gölpınarlı (Ed. ), Hurûfilik Metinleri Kataloğu, XII. Dizi- Sa. 6a TTK, 1989. Fazlullah Esterâbâdî, Câvidannâme; Dürr-i Yetim İsimli Tercümesi, haz. Fatih Usluer, İstanbul, Kabalci Yayınevi, 2012. Fatih Usluer, "Le Houroufisme. La doctrine et son influence dans la littérature persane et ottomane", EPHE-Paris, Phd Thesis, 2007. Fatih Usluer, "Misâlî'nin Miftâhu’l Gayb'ı Metin ve Açıklama", Turkish Studies, International Periodical for the Languages, Literature and History of Turkish or Turkic, Volume 2/2, Spring, S. 2, www.turkishstudies.net, (Ed. Prof. Dr. Gurer GULSEVİN- Dr. Mehmet Dursun ERDEM), pp. 697–722. Fatih Usluer, "Hurûfî Metinleri ile İlgili Bazı Notlar", Ege Üniversitesi Türk Dili ve Edebiyatı Araştırmaları Dergisi, S. 13, Ocak/Jan 2007. Fatih Usluer, "Nesîmî Şiirlerinin Şerhlerinde Yapılan Yanlışlıklar," Turkish Studies, International Periodical for the Languages, Literature and History of Turkish or Turkic, Volume 4/2,Winter, 2009, , ss. 1072-1091. Rıfkı Melul Meriç, HURUFİLİK, Dil Tarih Coğrafya Fakültesi Basılmamış Mezuniyet Tezi, Ankara, 1935. Fatih Usluer, "Hurûfî Şifreleri", Journal of Turkish Studies, Volume 33/II, ss. 201-219. Fatih Usluer, "Hurufism Among Albanian Bektashis", The Journal of International Social Research, Volume III/15, ss. 268-280. Fatih Usluer, "Feyznâme-i Misâlî Neşirleri", Hacı Bektaş Veli Dergisi, Volume 56, ss. 299-323. Fatih Usluer, "Hurufilikte Rüya Tabirleri", Milli Folklor, Vol. 90, ss. 134-146. Fatih Usluer, "Les Themes Bibliques chez les Houroufis", Ishraq, Vol. II, ss. 426-443.